ITEM IS CURRENTLY OUT OF STOCK. IF ORDERED, WILL BE AVAILABLE IN 10 BUS. DAYS. This chestnut horse is ready for a day of riding, and comes prepared with English tack that includes a saddle, bridle and saddle pad. 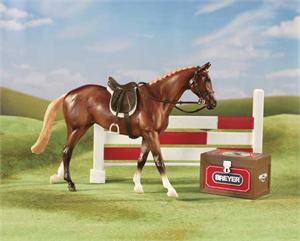 This set also includes a red and white jump and a tack trunk!